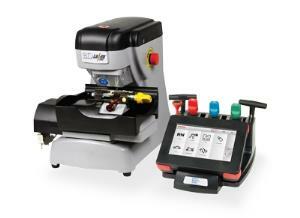 Designed specifically for the automotive dealer, the BD Laser Max™ electronic code cutter and duplicator offers the ability to cut high security (sidewinder), edge-cut as well as tibbe keys. The BD Laser can duplicate an original key or produce a new key to exact code specifications offering smooth, factory style cut patterns. Cutter wear meter is displayed on the touch screen, and pop-up messages alert the operator when to change the cutter. Quick change process allows the operator to change the cutter in less than 30 seconds. Password protection offers each operator their own sign on and password. Additionally, certain functions such as exporting data can be limited to the Administrator. Cutter safety shield eliminates pinch points and keeps fingers out of contact with the cutter. The BD Laser Max™ comes with on-site set up and service. MSC offers an internal dedicated staff to support BD Laser Max™ users. Three years on parts, labor, and software updates. Does not include the cutter.